Healthy Paws Pet Insurance is the #1 customer-rated pet insurance company offering comprehensive accident and illness coverage for dogs and cats. Here you can find our most recent awards, media coverage, news and press releases. 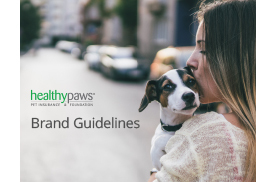 Healthy Paws proudly announces their end of year statistics for 2018. From an increase in enrolled pets to a breakdown of which conditions are on the rise (and which are less prevalent), the company offers an enthusiastic recap of 2018. Two students were awarded scholarships to help with their college tuition, courtesy of Healthy Paws Pet Insurance's academic scholarship program. Both recipients have proven excellence in their studies while logging in many hours volunteering for their communities, sharing in our goal of helping as many animals as we collectively can. Click through for winners. From the Rescue Race to helping those affected by natural disasters, the Healthy Paws Foundation has been busy helping the most vulnerable furry friends. Here's more on all the activity over the last year. The fourth Healthy Paws Rescue Race finished in a blaze of glory! The grant program supports nonprofits that help homeless pets and even pet parents in need. Here's more on the six organizations that participated in November 2018. 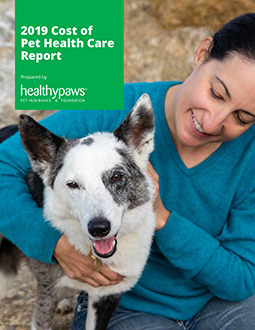 Healthy Paws has released the third annual Cost of Pet Health Care Report, a free, downloadable report supported by data from almost 500,000 claims submitted from June 2017 to June 2018. The report details the top ten most common conditions for dogs and cats and their corresponding veterinary costs, plus symptoms, treatment, and case studies. The third Healthy Paws Rescue Race was a success! The grant program runs multiple times a year, supporting nonprofit organizations that help pets in need. Six organizations are selected to participate, and grants are awarded based on the number of votes. Here are October's winners. After examining incident data from more than 500,000 claims filed between June 2017 and June 2018, we've identified the most common reasons our dogs and cats visit the vet, and how much pet parents can expect to spend for the latest and greatest treatment. Canine Journal has ranked Healthy Paws #1 yet again this year for best pet insurance provider. Citing "a strong and consistent offering" as well as offering an excellent product with great pricing and customer service to back it up, Canine Journal recommends Healthy Paws for pet insurance. More Pet Insurance Policies Are Being Sold. But Are They Worth the Cost? Rob Jackson, Healthy Paws CEO and co-founder, talks about how pet insurance can save pet parents thousands of dollars in light of new veterinary treatments. Did you know you can get pet insurance from your provider? PureWow breaks down this voluntary benefit and recommends Healthy Paws if your employer isn't already part of the growing trend. Healthy Paws' CEO and co-founder Rob Jackson discusses how pet insurance is growing among pet parents and will continue to gain in popularity. Healthy Paws CEO Rob Jackson weighs in on how pet insurance can help the affordability of pet health care. Healthy Paws CEO and co-founder Rob Jackson offers information on the cost of pet insurance when pet parents are looking to buffer the cost of a pet's accident or illness.